Special Containment Procedures: Due to the mental side effects of SCP-358, SCP-358 is to be kept locked at all times except during testing, and all windows are to remain boarded, with regular guard patrols to ensure that no unauthorized entry occurs. The entirety of the building should be sealed air-tight, and any leaks reported immediately along with any signs of forced entry. Anyone found inside the building with reasons other than testing should be evacuated immediately and held for questioning and observation. 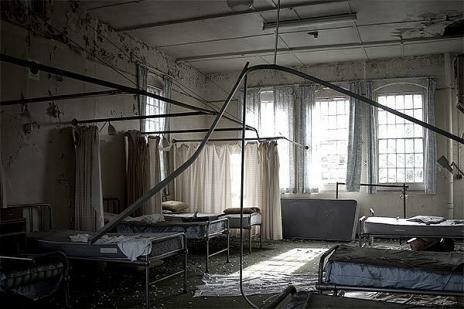 Description: SCP-358 is an abandoned trauma center located on the outskirts of ███████████, England. The grounds surrounding the building are overgrown with vegetation native to the area and characteristic of extreme neglect. The building's exterior is weathered but otherwise intact, with windows and entrances boarded up to prevent trespassing and vandalism. Air inside is arid, measured on average at 45 degrees Celsius, with hotter dry gusts of air that blow through the hallways from no discernible source. Exploration and monitoring has revealed anomalous activity characteristic of typical type three pseudospiritual manifestation (haunting) ranging from glowing spheres to full bodied apparitions, all of which appear exhausted and on occasion ask for water. Recognizable apparitions appear to be individuals who have been exposed to SCP-358 beyond the average (47 minute) psychological recoverability point in the past. The majority of these subjects reside in Foundation psychological observational facilities, and security footage shows them present in their respective units during the appearance of their apparitions within SCP-358. In the majority of cases (██%), individuals within SCP-358 experience a sense of disorientation upon entering the building, which slowly diminishes over time spent within SCP-358. Additionally, they report a growing sense of thirst, which begins to coincide with physical symptoms suggestive of extreme dehydration and heat exhaustion. These symptoms are not alleviated by hydration, even using a direct intravenous drip. As exposure time continues, the exposed individual will show a slowly increasing degree of mental degradation typical of heat stroke, which leads to an exponentially increasing degree of dissociative disorder. On average, affected individuals remaining within SCP-358 are not considered psychologically recoverable beyond forty-seven minutes of exposure. The remaining █% of subjects exposed to SCP-358 are unaffected, but are to be kept under observation to monitor for possible later development of effects. On rare occasions, affected subjects within SCP-358 expire suddenly of apparent poisoning. Autopsy in these cases always reveals the venom of one or more common North American desert dwelling predators in the bloodstream, usually that of Crotalus atrox, the Western Diamondback Rattlesnake. SCP-358 was discovered by the SCP Foundation on ██-██-1983 when two males, ages 20 and 22, were apprehended for trespassing after being found wandering its premises, unaware of their surroundings, by local law enforcement. Medical examination revealed only physical side effects, similar to exposure to a desert setting. The psychological evaluations of each person revealed a loss in mental capacity regarding self identification and location. A followup of a CT scan revealed nothing out of the ordinary. The police and medical reports were collected by SCP Foundation personnel which led to the current testing of SCP-358. Test subject is female, ██ years of age, █'██", with an athletic build. Upon entry, test subject observes that the climate is hot and dry. After exiting the building, the test subject appeared dazed and was observed to be suffering from slight dehydration. Test subject also brought attention to the sand in her shoes. The sand was then collected for further testing purposes. Test subject is male, ██ years of age, █'██", slightly overweight. Test subject entered the building as in the previous test, remarking on the arid climate inside. Further exploration revealed a layout not unlike that of any other hospital from the region and period. Upon exiting SCP-358, test subject began questioning who and where they were. Medical testing revealed that the subject was suffering from dehydration, and they were provided water to replenish lost fluids. Sand was recovered from the test subject's shoes. Test subject recovered fully in all areas except their mental state, and remains in psychological observation facility A. Test subject is male, ██ years of age, █'██", of a wiry stature. As in other testing, test subject began by observing a dry and hot climate on entering the building. Test subject orders were to examine the rooms of SCP-358. One hour into testing subject began complaining of dehydration and appeared slightly confused. After a duration of 2 hours within SCP-358, communication from the test subject stopped, and D-Class personnel were sent in to retrieve test subject. The D-Class located the subject in a room near the entrance, unconscious, and was recovered. Test subject regained consciousness soon after administration of an IV drip. Upon waking, subject was observed to be in a persistent vegetative state, unable to function, and was subsequently admitted to psychological observation facility A. Blood tests revealed trace amounts of a highly poisonous rattlesnake venom, found in bite victims of the deserts of southern California. As noted in Addenda 358-01 and 358-02, subject's shoes were filled with sand. On █/██/████, Security patrols captured video footage of a humanoid apparition in the north hall of SCP-358 begging for water. Comparison of video footage confirms that the apparition appears to exhibit mannerisms and appearance identical to test subject C, whose test results are noted in Addendum 358-03. Subject C remains unresponsive in psychological observation facility A, and demonstrated no change in behavior during the event.